Suresh Productions (Telugu: సురేష్ ప్రొడక్షన్స్) is a film production company, a subsidery of Rama Naidu Studios, founded by Dr. D. Ramanaidu. The production house of the company is Ramanaidu Studios which is located at Hyderabad, India. Suresh Productions, is one of India's largest film production companies with over 50 years of contribution to national and regional cinema. Devatha is a 1941 Telugu drama film directed by B. N. Reddi. Huge success of this film lead to the making of more such films with the same title in 1964 by B. Padmanabham and in 1982 by D. Ramanaidu. Devatha Full Length Telugu Movie Lecturer Prasad(N T Ramarao) and Seeta(First Savitri) are marride couple and happily living together. They has a son Madhu(Master Murali). Seeta looks after her Aunt and Uncle very affectionately. She also takes care of every family affairmeticulously. She came to know that her father Seshaiah(Perumallu) was sick and started by Train to go to village. The train met with an accident. The family members comes to know that Seeta is alive and felt very happy. She reaches home, but could not identify any one of them. Seshaiah writes his entire property in the name of Seeta and dies. Dr. Rukminamma was called for consultation. She identifies that the lady in the family is not Seeta and she is Kanya. Meanwhile, Prasad comes to know that Seeta died in the accident. The lady in their house is found to be Lalitha(Second Savitri) and arranges her marriage with her lover(Vallam). But he refuses with suspicion. Seetas relative Jagannadham(Rajanala) kidnaps Lalitha for the property, but saved by Prasad. Taking into account the affection shown on her by the family, Lalitha decides to continue the relationship to replace Seeta and married Prasad. 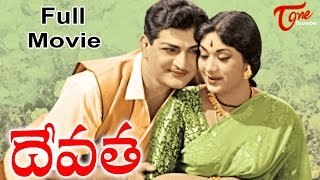 Subscribe for more Full Movies: http://goo.gl/6brEX Like us on FB@ https://www.facebook.com/shalimarcinema Follow us on@ https://twitter.com/shalimarcinema Lecturer Prasad (N T Ramarao) and Seeta (First Savitri) are a happily married couple. They have a son Madhu (Master Murali). Seeta looks after her parents-in-law very affectionately. She also takes care of every family affair meticulously. She comes to know that her father Seshaiah (Perumallu) is sick and starts home by train. The train meets with an accident. The family members come to know that Seeta is alive and rejoice. She reaches home, but is unable to identify any of them. Seshaiah leaves his entire property in the name of Seeta and dies. Dr. Rukminamma is called for consultation. She identifies that the lady in the family is not Seeta. Meanwhile, Prasad comes to know that Seeta died in the accident. The lady in their house is found to be Lalitha (Savitri) and arranges her marriage with her lover (Vallam). But he refuses with suspicion. Seeta's relative Jagannadham (Rajanala) kidnaps Lalitha for the property, but saved by Prasad. Taking into account the affection shown on her by the family, Lalitha decides to continue the relationship to replace Seeta and gets married to Prasad. Directed by K. Hemambharadhara Rao Produced by B. Padmanabham B. Purushottam Written by Veeturi (story, dialogues and lyrics) Starring N.T. Rama Rao Savitri Chittor V. Nagaiah B. Padmanabham Gitanjali Rajanala Music by S. P. Kodandapani Cinematography M. G. Singh Editing by M. S. N. Murthy Studio Vauhini Studios Release date(s) 1964 Country India Language Telugu Budget Rs. 5 lakhs.